Most people have an idea in their head of what the “perfect” smile should look like. Unfortunately, that ideal image rarely matches the one reflected in the mirror. The teeth withstand a lot of wear and tear and are frequently exposed to dark-colored foods and beverages, so it is not surprising that chips, cracks, stains, and discoloration are common flaws that detract from the beauty of the smile. Porcelain veneers sit over the facial surface of the teeth to conceal a wide range of cosmetic blemishes, including minor misalignment problems. In a treatment process that typically takes just two dental appointments, these porcelain shells drastically improve the appearance of the smile and allow patients to achieve their aesthetic goals. Dr. Byron W. Wall prepares patients for what to expect from porcelain veneers placement at his Albuquerque, NM cosmetic dentistry practice. Before porcelain veneers can be bonded to the teeth, the veneers need to be designed and fabricated, and the teeth need to be prepared. Dr. Wall takes the planning stage of porcelain veneers placement very seriously. It is important that each set of veneers meets the specific needs of the patient, and fits properly over the teeth so that the smile looks naturally beautiful when treatment is complete. 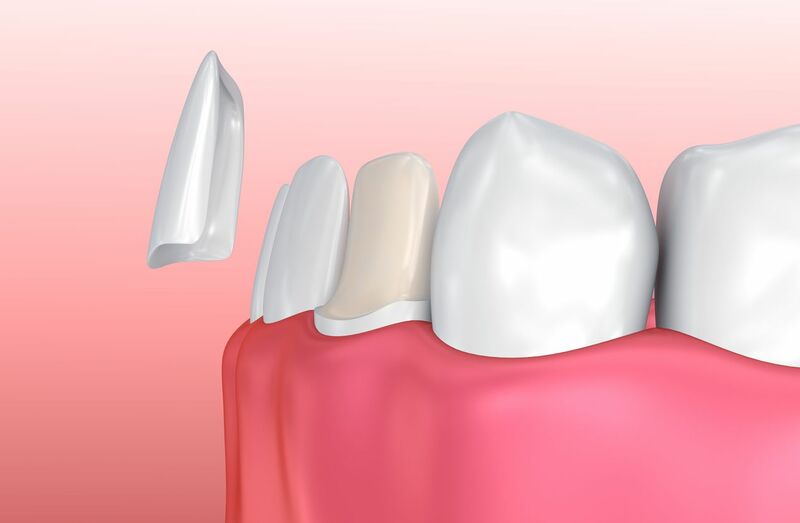 To design porcelain veneers, Dr. Wall will consider the color of the natural teeth, the size and shape of the teeth, and the overall proportions of the patient’s face. Dr. Wall wants porcelain veneers to enhance the appearance of the smile without looking artificial, so getting these details right is vital to the success of treatment. To ensure the veneers fit properly once they are complete, the teeth will need to be altered slightly. We make room for the porcelain veneers by removing a thin layer of enamel from all of the teeth that will be treated. Although the amount of tooth enamel that is removed is minimal, porcelain veneers will need to remain in place to keep the teeth protected. Once the teeth have been reshaped, Dr. Wall will take impressions of the teeth. These molds will be used alongside Dr. Wall’s design specifications to fabricate the ideal set of porcelain veneers for each patient. Porcelain veneers are typically ready to be bonded into place within just a couple of weeks after the initial planning appointment. The bonding process is fairly fast and simple, since the teeth have already been prepared. Dr. Wall will test the fit of the veneers before they are permanently attached to the teeth. If the fit it satisfactory, a thin layer of dental bonding material will be applied to the teeth and the veneers will be put in place. A dental light is used to harden the material and complete the bonding process. When treatment is complete, patients will have a more attractive smile that should last for many years. Porcelain veneers can address a wide range of cosmetic imperfections and leave you with brighter, straighter, and more attractive teeth. If you have questions about the porcelain veneers procedure, or whether you may be an ideal candidate for treatment, contact us at your earliest convenience.